Telegraph station at Rhyl, 13¼ miles. June 22nd and November 3rd. The important town of Holywell is situated about a mile from the station. Population 5,335, and built on the declivity of a hill, which gradually extends to Greenfield, the surrounding hill forming a kind of amphitheatre. It is one of the first towns in North Wales, in a commercial point of view. The far-famed Holy Well of St. Winifrede is worthy of a pilgrimage, its architecture is so rich, and well repays a halt at the station to go and visit it. The town owes its origin to this well, its stream having been made available to turn the machinery of extensive mills and manufactories, some of which are closed, but the Holy Well is as strong as ever in all its purity, ever gushing and throwing up 85 hogsheads of water per minute, as brilliantly clear as possible. It is visited by numbers of persons, who test its efficacy by the enjoyment of restored health. As a cold bath, perhaps, it is unequalled. Small cabins are built for the convenience of persons wishing to bathe. There are several paper mills in the vicinity. A short distance further on, concealed in a wood, is the seat of Lord Fielding, the views from which are exceedingly fine, particularly that towards the sea. The next object that attracts attention is Christ Church, situated on a delightful rural eminence above the estuary of the Dee. 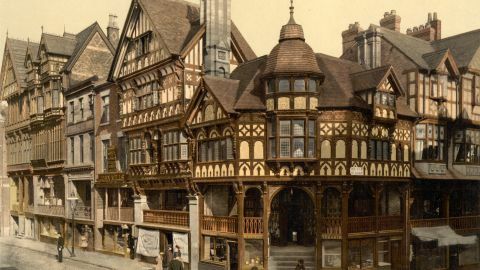 Chester is a genuine Roman city, built four-square, within walls, which remain to this day. 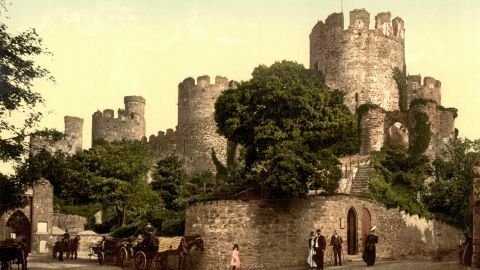 The ancient town of Conway is within the wall that were erected at the same time as the castle. Although not a manufacturing town, it has always been a place of some importance. This delightful place has now become one of great importance as a summer resort. 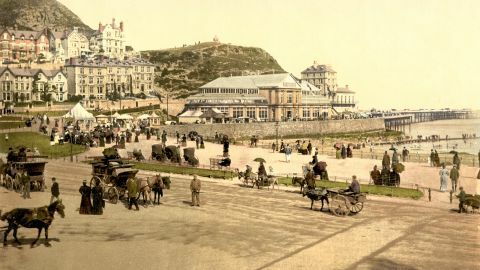 It is situated 3½ miles from Conway, on a promontory between the Bays of Conway and Llandudno.